The future School of Music Performance Hall replaced a commuter lot and construction east of University Drive has some students scrambling to find a spot close to their classes. 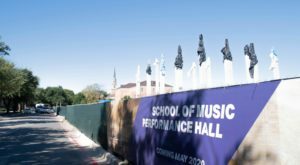 The new School of Music Performance Hall is scheduled to open in May of 2020. Photo by Robbie Vaglio. “I normally park in the neighborhoods around campus because there are no other spots,” said Katherine Jennings, a senior entrepreneurial management major. Cort Marley, a junior engineering major, said some of his friends have asked to park in his driveway on Greene Avenue to avoid the hassle of on-campus parking. With only a handful of available parking lots for off-campus residents, it’s difficult to find a parking spot if you are late to class. There are eight commuter parking lots on campus. Image courtesy of tcu.edu. “I’ll circle around four or five times, and don’t see a spot and don’t see anyone walking out so I have to go to a lot further away, and I still don’t see many spots over there,” said senior sociology major J.D. Miller. Jennings said some of her professors have occasionally been late to class because of the parking situation. After observing the behaviors of both professors and students in campus parking lots, Andrew Velkey, an associate professor of psychology at Christopher Newport University, created two parking strategies for anyone struggling to find a spot to use. The first strategy is to take the first spot you find, instead of looking for the closest available spot. Velkey determined that people who use this strategy almost always got to their destination quicker. He said people should look beyond the front row when finding a spot. Strategies change when the parking lot is full. When there are no available spots in the parking lot, Velkey suggests simply sitting and waiting until someone makes a spot available for you. According to his research, people who sat and waited were three times more likely to find a spot than someone who actively searched down every aisle. This student failed to find a parking spot in the lot north of the library. Photo by Robbie Vaglio. DeAnn Jones, coordinator of parking and transportation services, said there is plenty of parking for commuter students, but some may need to go out of their way to find it. Lots 3 and 4, just north of Amon G. Carter Stadium, are open to commuters. 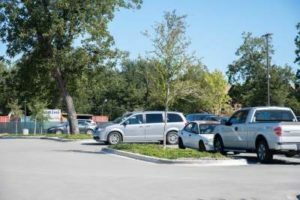 TCU has no intention to add additional commuter lots in the near future. Previous articleMillennials have power to define the midterms. Will they use it?